From hot dogs to colonial iconography, Breese Little serves up two more eye boggling, thought provoking exhibitions. Cuban artist Douglas Pérez Castro’s The Fifth World exhibits oil paintings in the ‘costumbristo’ style. During the 19th century in Cuba and other Latin American countries costumbrista artists were interested in depicting their daily lives, surroundings and inhabitants with a focus on national identity by exploring and celebrating the similarities and differences from European nations. By trying to highlight the norm it actually accentuated the differences and eventually the images transformed and began typecasting the people they were trying to celebrate. Pérez Castro’s caricatures are dark, humorous and uncomfortable. 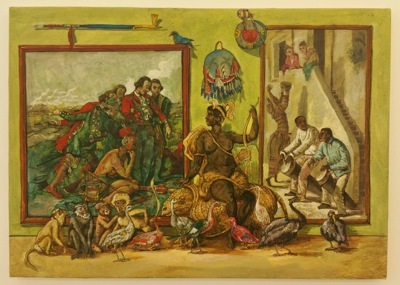 His displacement of black faces into exotic fruit, a woman surrounded by monkeys and other such animals while being observed and scrutinised by white European men in a painting highlight an extreme ‘otherness’. UK artist Freya Pocklington’s work displayed on the second floor is also a dramatic and comic discussion of society. In Hot Dogs and Problem Pets her focus is on the role of pets and wild animals in our society and how we are interfering with evolution. Her bright and colourful crayon and ink works are surreal and in three of the pieces echo the hazy, confused dream-like state experienced in A Midsummer Night’s Dream. With watery ink and over drawn opaque flowers she produces a light feel to a busy and at times overcrowded picture plane. Pocklington fills her work with human and animal interactions, flora and fauna and hot dogs. A confusing state occurs when the animals become anthropomorphised and the humans becoming more animalistic. Bold, strange, uncomfortable, these pieces of art can’t be accused of being boring. Whether you find them aesthetic pleasing or not the discussion of society is one we can all be part of.